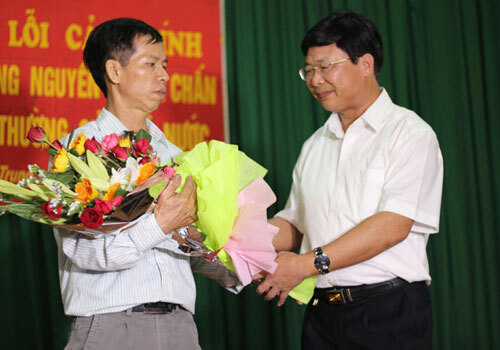 HA NOI (VNS) — The Ha Noi Supreme People's Court yesterday issued a formal public apology to Nguyen Thanh Chan, an innocent man who served ten years in prison due to a wrongful murder conviction. Deputy Chief Judge of the Supreme People's Court Ngo Hong Phuc read the public apology to Chan in his hometown in the northern province of Bac Giang's Nghia Trung Ward. On August 15, 2003, a woman named Nguyen Thi Hoan from Me Village in Nghia Trung Commune was killed at her home. Chan was the main suspect and was arrested by the provincial police for murder on September 28, 2003. On March 26, 2004, Chan was sentenced to life in prison by the Bac Giang Province People's Court and was forced to pay VND35 million (US$1,610) to the victim's family. After his conviction, Chan maintained his innocence and made an appeal. However, the Supreme Court dismissed his appeal and upheld the initial sentence. Chan continued to make attempts to prove his innocence, and his family campaigned for his release. Nguyen Thi Chien, Chan's wife, lodged a petition on July 9, 2013, with evidence showing the real killer was Ly Nguyen Chung, 25, also from the commune. On November 4, 2013, the Supreme People's Procuracy signed a decision asking for a review of the case, after Chung admitted to police he had committed the crime. On January 25, 2014, the Ministry of Public Security ordered Chan's release. At the meeting, a representative of the Supreme People's Court said it would work with authorised agencies to negotiate and calculate compensation for Chan.